Why am I not seeing the Tabs in the Person View ? Why am I getting Bad Search Results? How to manage a large Marriage Report ? A FTM2017 (for the Mac) was having difficulty managing a large Marriage Report, where relationships needed to be updated. Where to ask questions ? Due to some unfortunate circumstances I am no longer answering nor responding to questions on Facebook and the Family Tree Maker groups that are there. 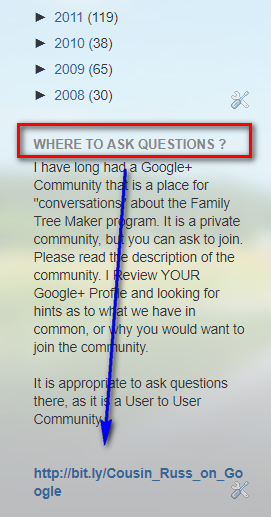 I have always had a place for users to ask questions in the About Tab on my Blog. AND I have had a Community on Google+, where people can have conversations about Family Tree Maker. Neither of which get much traffic. I have added a new text box in the Right Panel of the Blog, just below the Archives of this blog. The subject is Where to ask question? at the bottom is a link that will take you to my Google+ Community. There is a place to ask to join the Community. Before you do, read the description of the community, on the Left, and the Pinned Post in the Community. Don't overlook clicking on the 3 dots, as the full post does not show when you look at the Community before joining. When you ask to join, I look at your Google+ Profile to see what we have in Common, so I know why you want to join this private community. I am looking for something in your profile for that. Who you follow, kitten photos, don't count. I am looking to see if the requesting PERSON has something in common with the Community, and that requires a little work to add that information to your profile. Please read those two documents, as I have tried to explain the purpose and goals of the Community. Here is a link to that community. How to Un-Ignore a Shaky Leaf Hint for FTM2017? After I posted the How to Ignore a hint in FTM2017, and was successful, I really did NOT what to ignore that hint. I spent some time trying to determine how to do this, and here is my result. 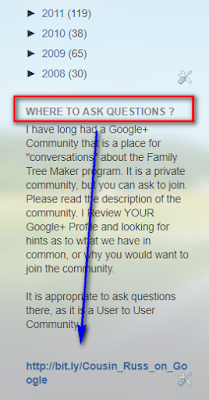 I will continue to look for a better answer, and I have provided Feedback to Family Tree Maker on this problem. Who or What is linked to this Media File ? Why doesn't the IGNORE button Work ? In response to a user report problem about the Ignore Button in FTM2017, Web Search Workspace. I'll try to explain how it works. There was a question in the Family Tree Maker Facebook Group about how to use the Filter Feature to add a photograph to any one living at that address. Never thought to blog about this, sorry to take so long. 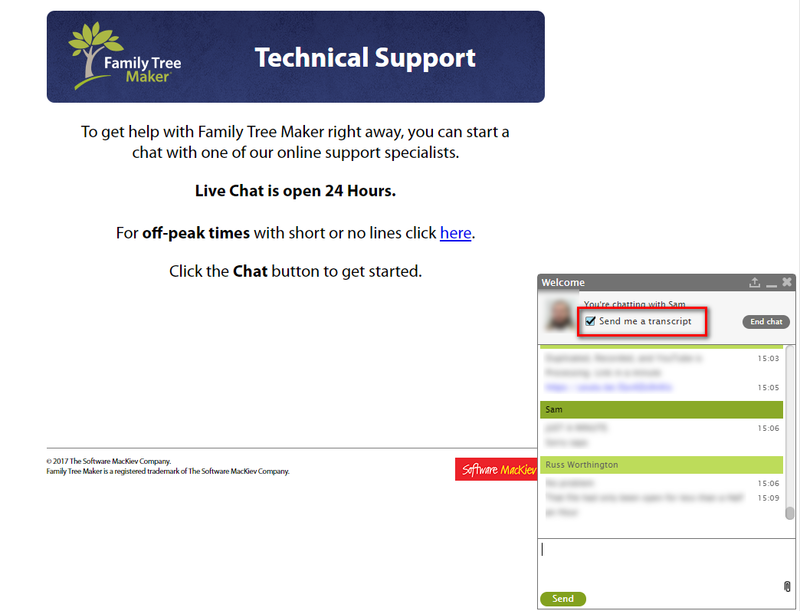 If you have a problem with Family Tree Maker, the first place to visit is the Live Chat that Software MacKiev provides. The Live Chat Hours are currently open 24 Hours a Day, 7 Days a week. It is not a telephone number, but is probably better than a telephone call, because you can set up a Transcript of the Live Chat "conversation". This is the Live Chat screen, and in the lower right is a conversation I am having now. And the End of my Chat, I will receive that transcript with the steps I may need to do, following our conversatoin. There may be issues observed during the FamilySync™ feature. 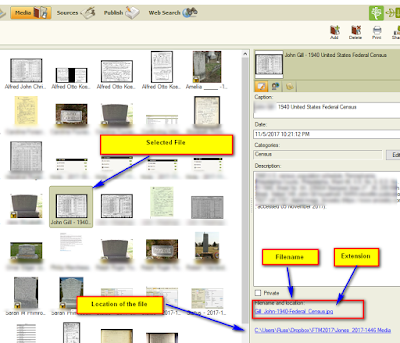 You will also see the filename and extension in the Media Workspace, Collection Tab or the Detail Tab.with an Media File selected. 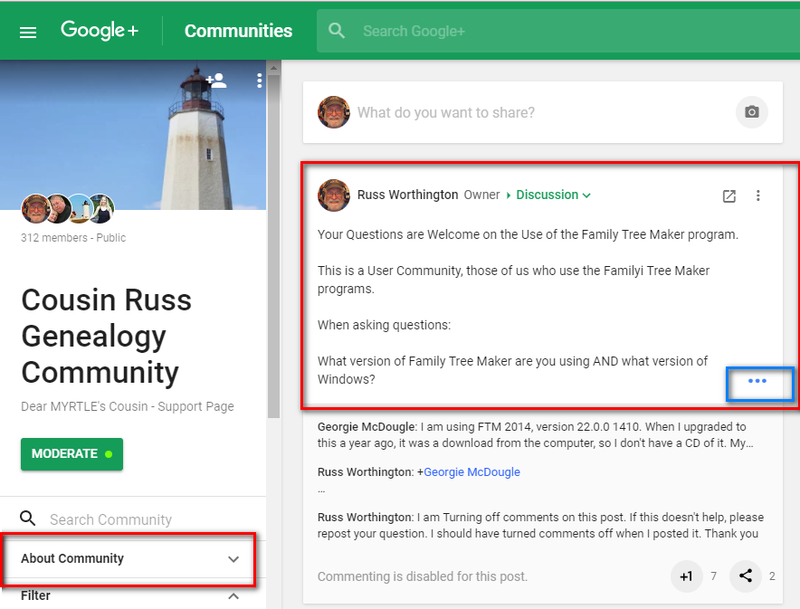 I have long had a Google+ Community that is a place for "conversations" about the Family Tree Maker program. It is a private community, but you can ask to join. Please read the description of the community. I Review YOUR Google+ Profile and looking for hints as to what we have in common, or why you would want to join the community. It is appropriate to ask questions there, as it is a User to User Community. A Blog is not a very helpful place to troubleshoot a problem with Family Tree Maker. There is plenty of help, in the Help Menu of the program that is specific to where you are in the program; In the Help Menu, there is a link to the Family Tree Maker Tech Support website. Please use that link. Please use these as a resource for problems that you may have with the use of the program. I am a long time user of Family Tree Maker.